AMHERST — The University of Massachusetts Amherst is set to announce today that it will build a $182 million special complex to house and teach its most elite students, an effort to bolster the university’s academic standing and national reputation. The 490,477-square-foot building will include rooms for 1,500 students in the Commonwealth Honors College, which is a key element of the university’s work to attract more high-achieving applicants. The building, scheduled to open in 2013, will include two faculty apartments, nine classrooms, and student services offices. It will also feature a cyber café and lounge space for students to meet and study together. In addition to the new building, made possible with money the university is borrowing, UMass plans to hire 50 tenure-track faculty over the next 10 years who will be appointed to teach both in the honors college and to the general student population to help address the university’s faculty shortage. While more schools, including Boston University, have begun offering specialized honors programs for top students, few public universities have combined housing, academic, and administrative services under one roof, UMass officials said. Arizona State University, which opened a 9-acre honors campus last year, comes the closest, Clarkson said. Commonwealth College at UMass Amherst, established in 1997 by the state Board of Higher Education, is the only honors college among the state’s 29 public universities and colleges. Nineteen other Massachusetts public colleges, including the three other undergraduate UMass campuses and 10 community colleges, have honors programs that are not as rigorous. 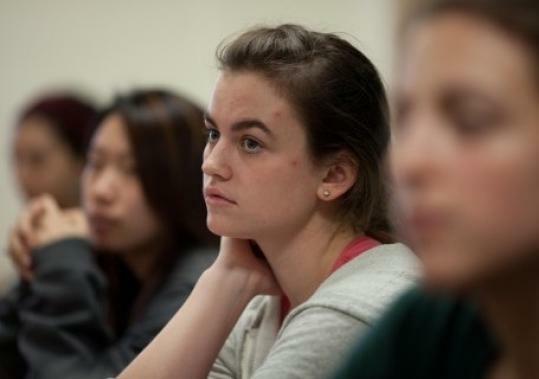 Honors students at UMass Amherst are typically invited into Commonwealth College as freshmen, based on their high school transcript, College Board scores, and leadership potential. This year, about 3,100 of the university’s 20,000 undergraduates are in the honors college, and about 80 percent of them are from Massachusetts. The 485 honors freshmen have an average Scholastic Assessment Test score of 1334 and an average high school grade point average of 4.16, significantly higher than the average SAT score of 1167 and GPA of 3.61 for the overall first-year class. Commonwealth College students are more likely to have smaller classes and tenure-track faculty members, while their nonhonors peers often contend with lecture halls packed with hundreds of students and classes taught by adjunct lecturers. Current Commonwealth College students take at least one honors course each semester and write a thesis in their senior year. The honors courses offer more in-depth discussions, more challenging readings, and more assignments than general university courses. Nonhonors students are allowed to enroll in honors classes when space is available. UMass, facing intense budget pressures, this year began charging honors students a $150 fee per semester to pay for faculty, smaller classes, and other programs. Honors students currently have the option of living together on the floor of a dorm, but their classrooms are located all over campus. “Our original vision was the students would go to class and then sit around and talk about the material as they bumped into each other, but that just didn’t happen,’’ Clarkson said. University officials hope that the new building will allow UMass to expand the honors college to 600 freshmen a year. They hope to increase universitywide honors enrollment to 4,200, the level it was at before the Legislature cut funding two years ago. The new dorm rooms and classrooms, to be located near the center of the sprawling campus on what are now tennis courts, will also free up space elsewhere on campus, allowing the university to expand its overall out-of-state enrollment, which has been one of Holub’s revenue-generating strategies to cope with the continued decline in state funding. Zach Nemtzow, a junior from Needham, said the new honors college building will help the university create the sense of community students want and could become a main selling point for UMass. Nemtzow said he chose the school over Boston University and American University because of the honors program, which he believed would give him just as good an education, at less than half the cost. “UMass is a really big school, and any way you can create a smaller community is great, especially if it’s focused around strong academics,’’ said the 20-year-old physics and political science major. While he won’t be around to enjoy the new facility, Nemtzow said he still stands to benefit. “Anything that makes UMass look better compared to its competition will make my degree worth a lot more, because people will see the school as a lot better,’’ he said.